The average shop-bought or supermarket sandwich triangles contain lots of bread and not a lotta filling. They also add up in calorie value - OK calories not that important, but it's what the calories are made up of that I, as a nutritionist, am concerned about. Let's also consider the cost - for the £2.25 average that's taking into account the bog standard egg & cress and the more glamorous options containing a minute sliver of sun-dried tomato. Every sandwich seems to taste the same as all the rest and you end up with an unappetising, un-nourishing, boring lunchtime snack. Making your own sandwich is not difficult, time consuming or expensive. It just requires a little planning and perhaps setting your alarm clock 15 minutes earlier, or even, horrors being really organised and making it the night before, wrapping in foil and keeping it in the fridge. You can health up your lunchtime choice by opting for wraps, pitta pockets, adding lots of crisp lettuce and other salad stuff, swapping stodgy white for granary or wholemeal baps. bread and pile it high with topping. Don't be tempted to avoid a smearing of butter to keep the bread from being soaked by the filling, if you prefer you can choose from the PURE range of dairy and hydrogenated fat free spread options and remember to add ingredients to perk your sandwich up. Grate extra mature Cheddar Cheese - it goes further for less fat, you can even opt for the 30% reduced version, yoghurt instead of mayonnaise for tuna, chopped spring onion to perk up a light cream cheese. Natural Manna has so many ideas for tasty fillings for both sandwiches and baked potatoes - you wouldn't need to duplicate your choices for a couple of months at least. Unless of course you wanted to! Sundried tomatoes, olives, picallilli, sweet pickle, pickled cucumber, red cabbage, beetroot, sliced cherry tomatoes, wholegrain mustard, horseradish sauce. These are all ingredients that should be the mainstay of any grocery cupboard and fridge because they perk up meals. Planning, Planning and Planning. That's the KEY. 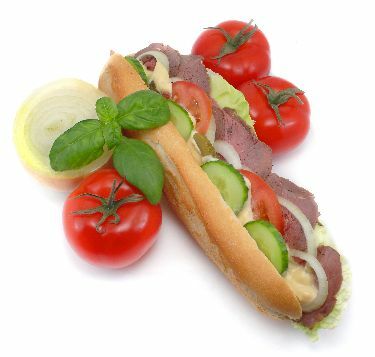 So what are you waiting for.....start planning your healthy lunchtime sandwich! For more news and stories, subscribe to our free Anglesey Today Newsletter here. It's as easy as 1-2-3!